Pollution from the Major Deegan Expressway, along with other highways that surround the South Bronx raises the risk of lung cancer. Air pollution in the South Bronx may be more dangerous than previously believed. For more than a decade residents, politicians and advocates have pressed to curb air pollution in the region with a focus on the epidemic of asthma and other chronic pulmonary conditions. Now the International Agency on Cancer Research, a branch of the World Health Organization, is warning that outdoor air pollution causes cancer. This new research underscores what many residents have known for years; that the busy highways, truck routes and industrial facilities that interlace the South Bronx have a devastating effect on public health. The WHO warning adds a new dimension to these concerns: that not only tobacco use but air pollution can lead to lung cancer. Constant pressure for environmental justice have resulted in significant improvements for the Bronx. Pollution levels monitored by the federal Environmental Protection Agency show a steady decline across the city since 2002. The greater New York region ranks far behind more notorious offenders like the Los Angeles metropolitan area. However, while the levels of pollution have fallen, the rates of lung disease across New York City have remained high, and the disparity between the Bronx and the rest of the city has grown more pronounced. 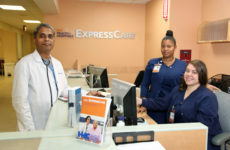 Last year the rates of asthma in the Bronx were nearly twice what they were in other boroughs, according to the annual community health survey conducted by city Department of Health and Mental Hygiene. 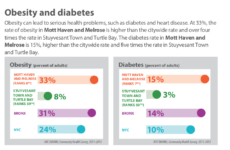 In Mott Haven and the rest of the South Bronx more than 10 percent of neighborhood residents reported having an asthma attack in 2012, the most recorded since 2003. While the death count from cancer has shrunk in recent years, cancer still remains the second most common cause of death in the city and the leading cause of premature death. Lung cancer takes more lives than any other form of cancer. Efforts to combat lung cancer have focused on anti-smoking campaigns, from pointed advertisements and increased taxes to the recent ban on cigarette sales to people under 21. 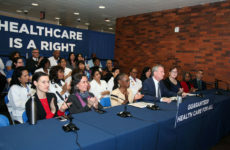 In the last 10 years the number of smokers in the Bronx has decreased by 34 percent according to the health department. But rates of lung cancer have only fallen marginally. In 2010, the most recent data showed that the Bronx has only seen a two percent reduction for men and a 5 percent drop for women. The association has played an influential role as a lobbyist for pollution health policy, and it organizes a vast network of support groups for people with lung disease. But its instructions on avoiding pollution highlight how little individuals can realistically do. Stay indoors when the air quality index reaches unhealthy levels, the lung association advises on its website. The effectiveness of that tactic is limited, say many experts. Thurston helped conduct a 2006 study that linked traffic density and diesel fume particles to the high rate of asthma among children in the South Bronx. The study found that maximum levels of exposure occurred during weekday mornings as children walked to school and residents walked to work and that the closer residents were to a highway, the higher the rate of exposure. Since Congressman Jose Serrano filed an environmental justice complaint with the EPA in 1997 on behalf of the South Bronx, public policy on pollution has made advances. Last year Mayor Michael Bloomberg announced that part of a $10 million dollar federal grant will help improve rail access and reduce pollution in the Hunts Point Market. In August Governor Andrew Cuomo launched a $19 million effort to encourage electric, hybrid and retrofitted diesel engines for trucks, with $10 million of the fund earmarked for New York City. However Serrano did not answer questions about how much attention this issue has received on the federal level. His most recent bill to reduce air pollution has remained stalled in committee since January.